Birth date and place 1821 Mitchelstown, Cork, Ireland. 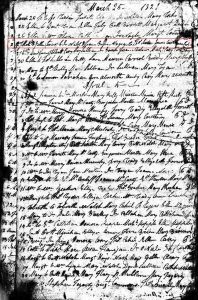 Baptism date and place 27 Mar 1821 Mitchelstown, Cork, Ireland. Physical Description Height: 5 ft. 5¼ ins. Complexion: fresh. Eyes: blue. Hair: brown. Marriage date and place 1860 Armagh, Ireland. Spouse Ann Dowd (Dowed, Dowel, Doutt). Children Johanna b. 1861, Armagh, Armagh, Ireland. John Merchantman b. 1862, at sea on board Merchantman en route from England to Western Australia. Margaret b. 1864, Fremantle, Western Australia. Patrick Michael b. 1868, Fremantle, Western Australia. Death date and place 1 Oct 1884 Fremantle, Western Australia. Cause of Death: Cardiac Disease. Burial date and place October 1884 Skinner Street Cemetery, Fremantle, Western Australia (assumed, record not extant). 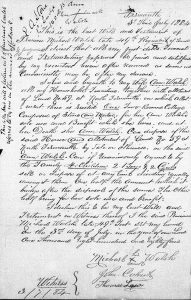 Will and Probate Will: 3 Jul 1884. Probate: October 1885 Supreme Court of Western Australia. Regiment(s) 49th (Princess Charlotte of Wales’s or Hertfordshire) Regiment. Regiment No. and Rank #1415 Private. 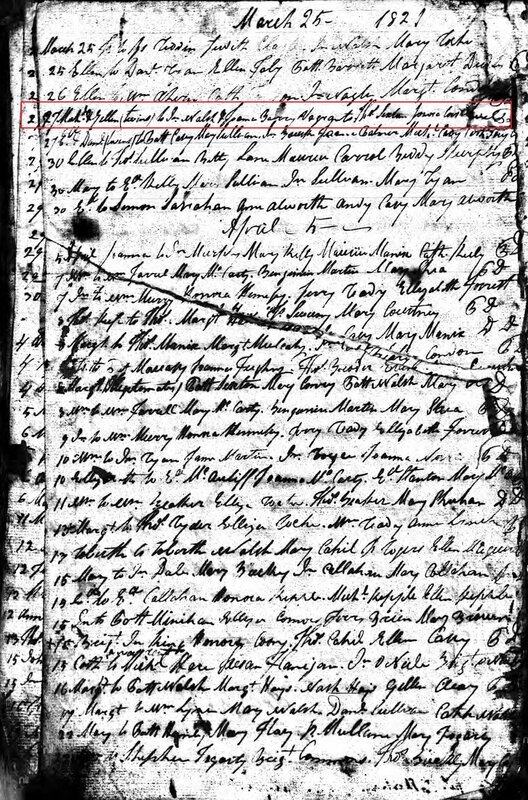 Attestation date and place 20 Jul 1840 Limerick, Limerick. Service/Campaigns East Indies 1 year 2 months. China 1 year 6 months. Crimea 1 year 5 months. Musters 1851 Fermoy, Cork, Ireland & Corfu, Ionian Islands [WO12-6074]. 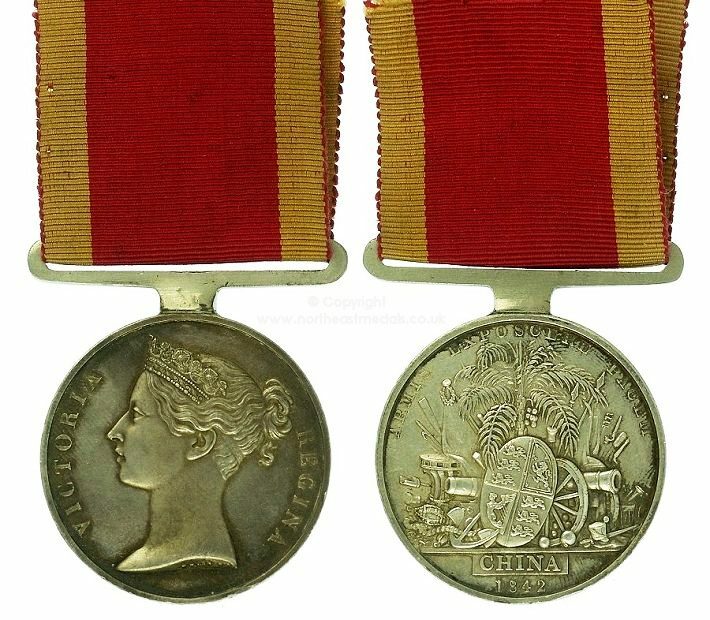 Medals, Clasps and Badges China Medal 1842. 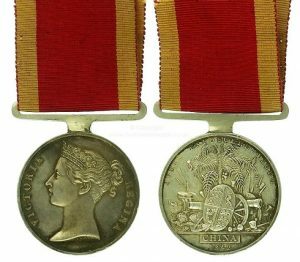 Crimea War Medal clasps Alma, Inkermann, Sebastopol. Turkish Crimea Medal. Casualty/Medical Casualty Roll: Slight Wound. Final Attack on the Redan. 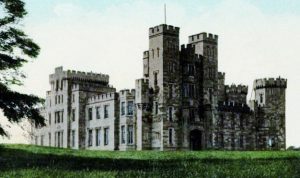 8 September 1855. Slightly wounded in the right arm. Regimental Courts Martial 8 Jan 1846 Tried and convicted for being drunk on Inlying Picquet. Sentenced 40 days imprisonment with hard labour. Remitted 10 days. 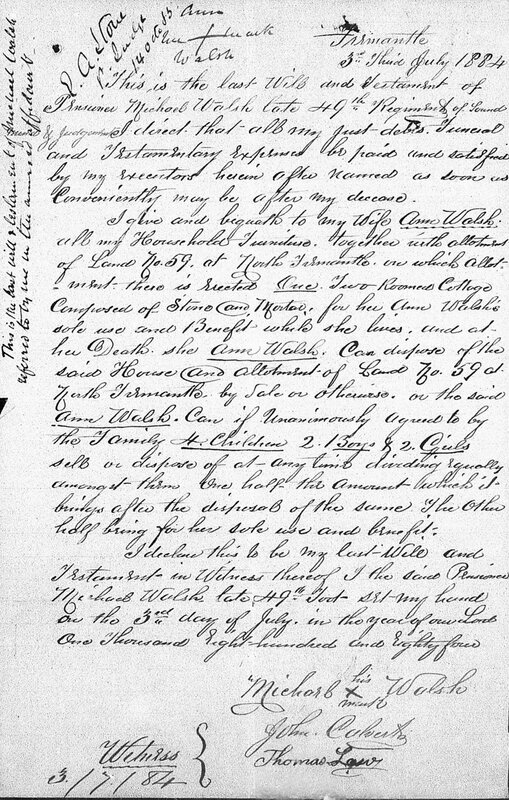 In confinement 26 Dec 1845 to 5 Feb 1846. 15 Jul 1846 Tried and convicted for breaking out of Barracks when confined thereto and returning drunk. Sentenced 30 days imprisonment with hard labour. Imprisonment 11 Jul 1846 to 15 Aug 1846. Seventeen times entered in the Regimental Defaulters Book. Discharge date and place 4 Feb 1862 Belfast. Length of Service 21 years 124 days. Post Discharge Pension District Armagh. Increased to 1/6d. on 4 Jun 1878 for service EPF. Suspended when re-entering EPF. Again increased to 1/6d. on 18 Jan 1881. Departure and Arrival 12 Oct 1862 London; 14 Feb 1863 Fremantle. Via Bermuda. Enrolled Guard 01 May 1886 to disbandment 31 Mar 1887. Servant to J F Stone, Comptroller General of Convicts. Land Grant/Purchase 10 Feb 1882 North Fremantle Lot 58 (sic) 2 acres (grant). Note: Occupied Lot P59 owing to assignment error (see Will in sidebar).